Interesting people with their interesting pets! 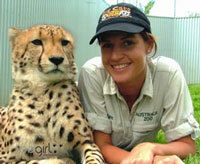 Claire Madden, a passionate and determined animal conservationist, has dedicated her life to wildlife and is striving to become a recognised wildlife presenter through educational documentaries. Claire, better known as ‘zoo girl’ has kick started her career in media by being a participant in the reality TV show Big Brother. Claire aims to transform this media experience and the character she established, to develop a series of successful documentaries focusing on education and conservation of wildlife worldwide. Claire was born in Geelong in June 1983, and at 23 years of age has already achieved numerous awards and experiences in the animal industry. 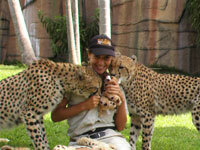 Having worked with a variety of species of animals including Cheetahs, Tigers, Birds of Prey, Dingoes, Koalas and Orangutans, Claire’s passion does not stop with any one species. In 2004 Claire graduated from the University of Queensland with a Bachelor of Science, Animal Studies and was awarded First Class Honors. 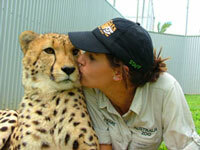 With plans to commence her PhD in wildlife reproduction in 2005, Claire decided to postpone further studies after being offered a job with Big Cats at Steve Irwin’s Australia Zoo. Claire’s passion has taken her around the world with visitations to Sepilok Orangutan Sanctuary in Borneo and Southern African Wildlife College in Kruger National Park, South Africa. It has been an ambition of Claire’s to utilize media to not only establish a recognisable profile in conservation but to raise much needed funds and awareness for conservation projects worldwide. Having achieved her goal of gaining media exposure for her passionate conservation views through Big Brother, Claire is eager to use this as a platform to launch into documentaries as soon as possible.